It's no surprise that the Electro-Voice RE20 is a favorite among broadcasters and sound engineers. It's no surprise that the Electro-Voice RE20 is a favorite among broadcasters and sound engineers. This rugged dynamic microphone was engineered for the human voice. 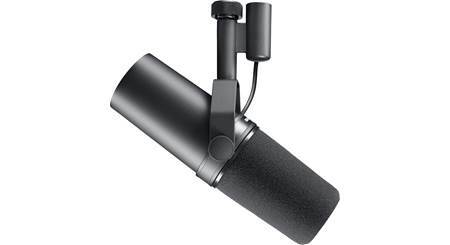 It features a heavy-duty internal pop filter and built-in shock mount to minimize vibration noise. The RE20 is great for spoken word formats, such as radio and podcasting, as well as recording sung vocals. The RE20's VariableD™ capsule minimizes the "proximity effect,” ensuring consistent tone even when recording off-axis. 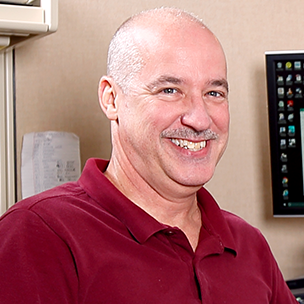 The mic's large diaphragm and low-mass aluminum voice coil accurately capture fine details. A built-in humbucking coil guards against hum and EMF interference, ensuring a clean recording. 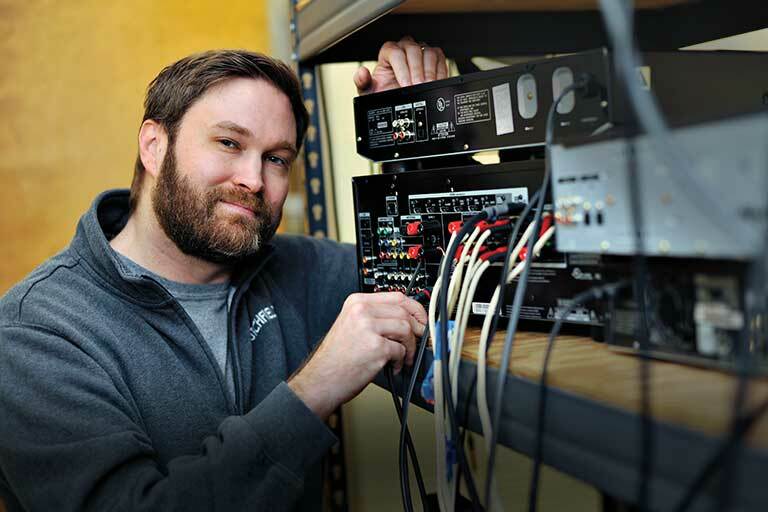 The steel case keeps the mic's electronics protected, ensuring years of use, even with constant setup and teardowns. Overview: The Electro-Voice RE-series is designed to deliver consistent, high quality performance. 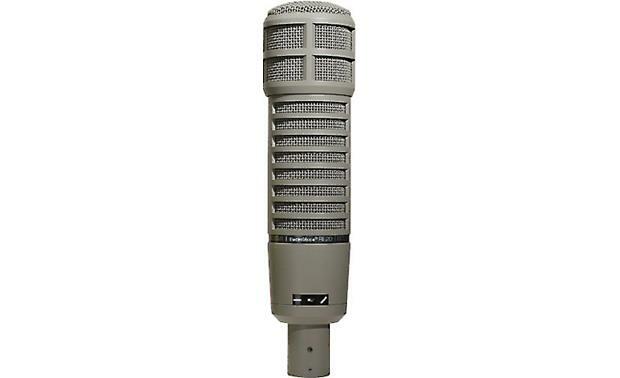 The original RE20 debuted in 1968, and quickly became a standard in the broadcast industry because of its smooth performance with the human voice. This cardioid dynamic microphone is also ideal for voice-overs and music production, particularly as an instrument or kick drum mic. The RE20 comes with a sturdy swiveling stand clamp, a 5/8"-to-3/8" thread adapter, and a padded, zippered storage case. Cardioid Pickup Pattern: The RE20 has a true cardioid polar pattern for maximum gain before feedback, a voice-tailored frequency response, and no coloration at 180° off-axis. 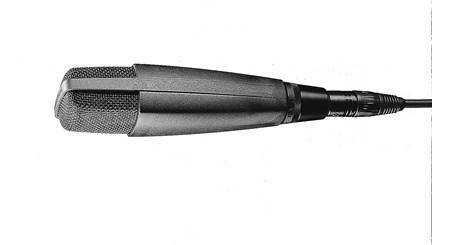 Bass Roll-off Switch: Near the rear of the RE20 microphone is a 2-way bass roll-off switch. You can set the microphone for a flat response, or to roll-off the lower frequencies between 100Hz and 400Hz at 4.5dB per octave. Construction: The RE20 is made with a sturdy steel housing, and features an internal element shock-mount to reduce the pickup of mechanical noise. It is internally shielded with a "hum-bucking" coil to prevent unwanted noise. 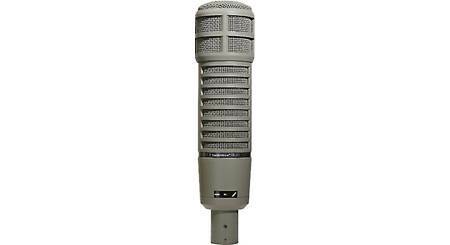 The microphone delivers the response of a studio condenser microphone (without requiring external power) due to its large Acoustalloy diaphragm and low-mass aluminum voice coil. An integrated blast and wind filter covers all acoustic openings on the microphone, and the heavy-duty pop filter eliminate the worry of plosives ("P-pops") or excessive sibilance. This allows the singer or announcer to perform with their lips almost touching the grille screen. The filter also helps to reduce contact noise. The RE20 comes with a Fawn Beige finish. 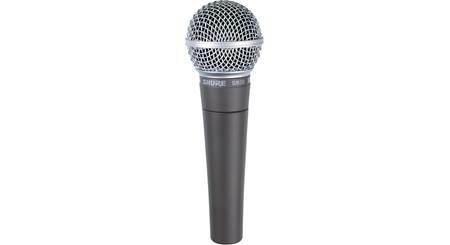 Dimensions: Diameter 2.144", Length 8.594"
Searches related to the Electro-Voice RE20 Large-diaphragm cardioid dynamic microphone.